I guess I'm on a very brief sour kick. Or, more accurately, Alex and Deb were on a sour kick. And again I'm drinking his left-in-the-lurch beer. I'm pretty sure Sambo visited Cascade recently, and I recall him thinking it was impressive, so I have high hopes for this one. This smells really terrific. Not all that unlike the Hanssens lambic, sour and dark-fruity- though, as it should, the cherry really stands out, giving it a nice rich depth. It's also appealingly winy- I guess based on very few data points that wininess is a characteristic I enjoy in my sours. There's negligible bretty funk. Yum. 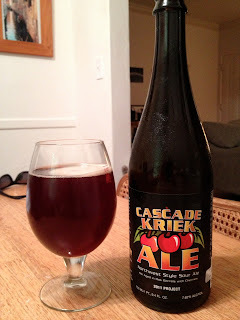 The flavor is pretty much identical to the nose- nice and tart with a whole bunch of cherry. No brett funk whatsoever. Extremely clean, just as the Hanssens was. This seems to me to be a straight-forward but excellently-crafted kriek. It's sour without being mouth-puckering, and fruity without making you feel like you're drinking maraschino juice. I'd drink this again without a second thought. Oh, and if there's a better aperitif beer, I haven't found it- it'll turn hungry to ravenous within about two minutes. For a simple aperitif beer, I do a Berliner Weisse w/ a "dose" or "shot" of raspberry syrup. I make that by bringing a cup of sugar and water to a boil, adding 2 containers of fresh or two bags of frozen raspberries, bringing the mixture to the boil again, off heat, strain and store refrigerated.